Published: March 13, 2014 at 10:36 a.m. In most drafts, you might see one or two players who are worthy of being taken with the No. 1 overall pick. I can't ever remember a year like this one, when eight, possibly nine, guys are deserving of that honor. This is a really, really quality draft with very good players, especially at the top. In my estimation, there are three quarterbacks who have a chance to be selected first overall, three offensive linemen, a defensive end, a linebacker and a wide receiver. Consequently, what we're going to see this year is a team with the No. 7, No. 8 or even the No. 9 pick having an opportunity to draft a No. 1-pick talent. With so many great players at the top of the draft, we're going to see a lot of teams outside of the top 10 looking to move up. It's likely that this list will be narrowed down as we get closer to the draft, and various players begin to stand out in their workouts. But when the bell rings on May 8 and commissioner Roger Goodell announces that the Houston Texans are on the clock, I believe any of the following nine players can expect to have their name called. The players are listed in alphabetical order. I thought Bortles looked OK at the NFL combine, but his performance at UCF's pro day next Wednesday will go a long way toward determining whether he should be in the running for the No. 1 overall pick. I'll be attending Louisville's pro day Monday and am really excited to watch Bridgewater throw and just learn more about him. I spoke last week with Bill Parcells, and he told me he met with Bridgewater for four hours and was very impressed with his confidence and football knowledge. 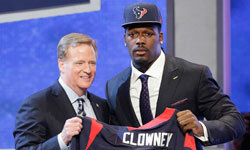 I had an opportunity to speak with Clowney this week and was really impressed with him as a person. He asked a lot of good questions and came across to me as very worldly. I've questioned his consistency before, but I absolutely think that if he sets his mind to it he can be a great player in the NFL for a long time. Lewan has been a well-kept secret of late and has been a little overshadowed by Greg Robinson and Jake Matthews, but he was another of my standouts from the combine. He has a solid football background -- his dad, Dave, was an offensive lineman at the University of Minnesota -- and played four years at Michigan. He might be best known as the lineman involved in Jadeveon Clowney's infamous hit from the Outback Bowl, but if you look at the tape closely, Clowney didn't dominate him; they were both really good on the play. Mack played only one year of high school football -- he was a basketball player during his sophomore and junior years -- but he's a very skilled guy who has great speed and acceleration coming off the line. I think Mack has the skill to be considered for the No. 1 pick, but because the linebacker position isn't as highly regarded in today's game as a quarterback or left tackle, I would not take him that high. I ranked Manziel No. 1 when I released my top 50 prospects a couple of months ago, and he was one of my nine standouts at the NFL Scouting Combine despite not throwing. Well, he'll throw March 27, and we'll find out more that day about Manziel's chances of going No. 1. Matthews' father, Bruce, played tackle, guard and center during his Hall of Fame career. I think Jake can do the same. He played tackle in college and will enter the league as a tackle first, but I do think that he'd make an excellent guard. Wherever he plays, I expect him to come in and be a starter right away. It's hard to believe, but Robinson hasn't played football very long. He was at Auburn for three years but was redshirted his first season. I think he has an excellent chance to be the first pick. He'll be a starter in his first year in the NFL, and I expect him to play for a long, long time. There are nine very good receivers this year, and I think eight of them grade out about the same. Watkins stands out from that group. He has great hands, tremendous speed and jumping ability, and is an excellent route runner. He solidified his position as a top-five player at Clemson's pro day last week. There are other great players in this draft such as Oklahoma State's Justin Gilbert and Texas A&M's Mike Evans who are close to the nine above, but I don't think they're in the running to be the No. 1 overall pick. The nine players listed above will trigger a lot of activity in this draft from teams determined to move up to acquire them. And I don't just mean teams in the top 10. Imagine, for example, if we reach the No. 7 pick and Clowney is still available. I would think a team like the Dallas Cowboys, who have the No. 16 pick and just let go of DeMarcus Ware, would put together a package to move up for him. That's just one scenario among many that are possible in what should be a very exciting draft. I expect a lot of action because of the number of great players at the top of the draft. But remember, the bar will be higher for teams to trade up this year because of the deal the St. Louis Rams made a few years ago in the RGIII trade -- receiving three first-round picks and a second-round pick. If a team with a top draft pick trades down, you can bet that lots of people, especially fans and the media, will be comparing that deal to the RGIII deal. There should be a lot of activity in the draft, but also a lot of scrutiny.